Seconds before the chairman of the jury announced my name and program at the 1994 American String Teachers Association national competition finals, he asked me what piece I would be playing in addition to the required Wieniawski Scherzo-Tarantella. A few months after the ASTA competition, my teacher Dan Mason put the first page of Don Juan on the music stand in front of me. I was sixteen, and though I didn’t know it, I was already preparing for orchestra auditions. At the end of the lesson, Mr. Mason handed me an article xeroxed from the official ASTA journal, 1992, written by Stephen Shipps. I saw the title: A Guide to Survival Repertoire, and then I noticed the author’s name. When I looked up, I noticed that Mr. Mason wore a mischievous grin. “Why, yes!” he replied, as his grin widened. I took the article home, went to my room, and closed the door. I knew that everything Mr. Mason handed me had a purpose, whether it was the strange piece by Strauss or this article by Mr. Shipps. 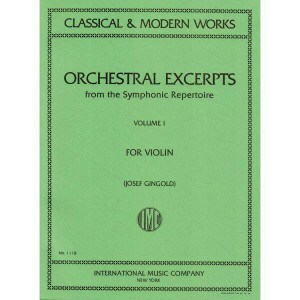 The “Survival Repertoire” from the title seemed to refer to orchestral excerpts like the first page of Don Juan. I was doomed to learn the Strauss… if I was to survive, of course. I tried to make sense of the article, but it was addressed to teachers like Mr. Mason rather than to me. It contained a scary-looking table and lots of music that I’d never heard of. And, let’s not forget that it was written by the man who had (just maybe?) caused my mental collapse. So I put the article into a box and tried to forget about it. But usually when you try to forget something, it bubbles up from subconscious to conscious. And it didn’t help that Mr. Mason kept assigning orchestral excerpts at my weekly lessons. Eventually I had to take the article out of the box and give it another try. Re-reading the Guide now, I have to smile. It makes so much sense: it’s the kind of article I’d like to write, if it hadn’t already been written more than twenty years ago! The premise: only a small percentage of violinists are lucky enough to have been given a thorough training in the standard violin etudes, during those years when they are impressionable enough to work without understanding why. The rest enter college or conservatory with an unenviable choice: give up on professional performing, or try to make up for lost time by going through all the etudes at lightning speed. The conclusion: replace the etudes with orchestral excerpts, and build a solid technical foundation while preparing for orchestra auditions at the same time! For example, if you haven’t already learned Rodolphe Kreutzer’s etude No. 8, a look at left-right hand coordination with string crossings, then learn Beethoven’s Leonore Overture No. 3 instead so that you have it in your back pocket when it appears on an audition list. It was a brilliant idea in 1992, and it’s just as relevant today. But it’s more than an idea: the Guide to Survival Repertoire contains a complete table of standard etudes and their orchestra excerpt equivalents. After I ran my New York Philharmonic Audition Challenge back in 2015, the majority of the participants let me know much they loved the etude work. That was a surprise! In fact, I got question after question about what other etudes would help in audition preparation. When I thought about it, I realized that someone else had already done my work for me. So I asked Mr. Shipps for his permission to share his article with you, which had been locked in the ASTA archives for more than twenty years. The Guide really needs to be read in its entirety, because it’s about much more than just a table of etudes and their excerpt equivalents. Shipps didn’t suggest that etudes have no value: in fact, he recommended a major course of etudes for those students who are able to handle them before college. Neither did he mean that excerpts alone could provde a complete violinistic or musical education. In the Guide, he placed them in their proper context along with scales, concerti, solo Bach, sonatas, and short pieces. If I were writing the Guide myself, today, it would look a bit different. Shipps’ choices of orchestral repertoire reflect not only the audition lists that were prevalent at the time of publication (1992), but the lists that his teacher, Josef Gingold, put together a generation earlier. Operatic overtures and miniatures from the classical and romantic periods figured heavily in these lists, and they do in the Guide as well. Today, we don’t see much Euryanthe or Fingal’s Cave at violin auditions. Modern lists are shorter and skew more toward symphonies, a few tone poems, and twentieth-century music that was “too new” for auditions of yesteryear. More to the point, auditions one or two generations ago rewarded experience and depth of knowledge of the repertoire: lists may have been short or long, but sight-reading was a common and accepted part of the process. Woe to those candidates who were unfamiliar with any of the pieces that were staples of the Big Five orchestra programs! Now it is no longer assumed that candidates for major jobs have studied or performed the major works. Blind, or screened, auditions, have something to do with this, since “experience” and “knowledge” in the unscreened days were often code words for “we know this guy, and we like him”. Today, sight-reading is included in the fine print, but it’s largely an empty threat. Deliberately or not, today’s orchestras value players who can deliver under pressure over players who know the repertoire. The best orchestras can demand both if they draft a big audition list. But in general, today’s shorter lists give everyone a shot as long as they are technically and musically prepared to play the pieces asked of them. That said, I enjoy seeing the variety of pieces in the Guide. It’s well worth a violinist’s time to look at an etude in the “Long Bows” section, say Kreutzer No. 1, and then look at Elgar’s Enigma Variations: Nimrod and see how success in one leads directly to success in the other, and to other pieces of the same type. So if it seems more appealing to work on Elgar than Kreutzer, go right ahead! Nimrod is a great tune, after all. And I’m constantly advising violinists to work on technique outside the excerpts from their audition list. It’s counterproductive, for example, to try and learn a spiccato stroke while working up the Schumann Scherzo for an audition. You’ll only graft bad habits onto a work that you’re supposed to be able to play in a few weeks’ time. I would normally prescribe a spiccato etude in such cases. But with the help of the Guide, you could choose Verdi’s overture to La Forza del Destino instead, as long as it wasn’t also on your upcoming audition! If you’ve worked through an etude and you’re looking for repertoire to expand on what you’ve learned, the Guide shows you which excerpts to tackle. If you’re preparing for an audition and need to brush up on fundamentals, the Guide shows you which etudes relate to each excerpt. If you are already familiar with any of the etudes mentioned in the Guide, my advice is to look at and listen to the orchestral excerpts that are listed in the table next to them. Find the connection between the etude and the excerpt. Then, when it’s time to work on the excerpt, you will already know the fundamental skills necessary to master it. If instead you are familiar with the orchestral pieces but not the etudes, then you have a golden opportunity: look up the etudes listed in the table next to the excerpts, and mine them for all they’re worth! You will then find that the excerpts yield to you much more readily in the practice room. I literally said this last night at our Nutcracker dress rehearsal. I commented that I had, as a clarinetist, forgotten how hard everything Tchaikovsky wrote always is, and that next time I needed something technical, I could just pull out a symphony and woodshed for days. We don’t have such a comprehensive chart, though, but it sounds like a fabulous idea, and I find excerpts so rewarding and enjoyable. Ha! The Nutcracker Overture (listed in the Shipps Guide) is one of the hardest things for us. Great guide! Aside from Gingold’s excerpt book, are there any other compilation books you can recommend? Things are easier now with YouTube. Since you really need the full part to go into any audition, you’re almost as well off just getting those clean parts and marking in some suggestions that you see. But the Ovation offering is interesting! Hi Angela, indeed you are! There was a screw-up where some of the folks who were already my email subscribers got stuck in a loop where they couldn’t download. I’ll send you a link. I’m in the process of fixing it, so in the meantime, if you’ve already signed up and haven’t gotten a link, just contact me and I’ll take care of you. Sorry about that! Like Angela I think I was already signed up to your website but I can’t acess the Shipps Guide. Could you please help me on that? Thank you a lot, Nathan! Will take care of it, apologies again! I would like to download the Shipps Guide but in my member library does not appear to me, why? This is an error on my site at the moment, but I’m hoping to take care of it today. Eventually the guide will not reside in the member library, because it’s something that anyone can download once they subscribe to my emails. I got your message and will send you a link to the download, thanks!